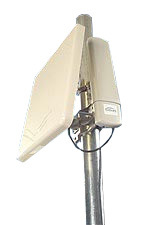 Motorola Canopy 900 Mhz Access Point Connectorized with 3 non overlapping channels, 4 watts of power, 36dB EIRP. This product can transmit out to 40 miles LOS, with up to 3 megs of throughput. Software version 8.2 AP-DES installed. Note: External antenna not included, power supply not included.